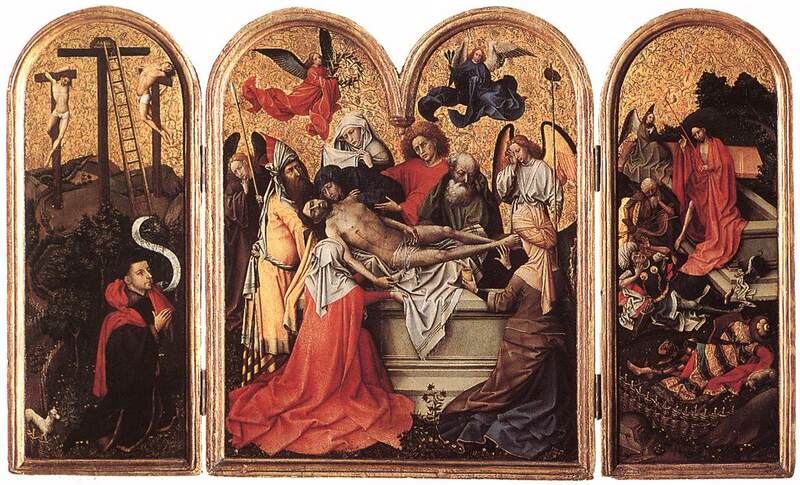 The Triptych is named after its present owner, the Count of Seilern. It is considered to be the earliest of the Master's works to have survived to the present day. Behind the figure stands the hill of Golgotha. The central cross between the two thieves has been left empty, with a ladder propped against it, to remind us of the Descent from the Cross. The Virgin, Joseph of Arimathea, Nicodemus and another Mary are holding Christ's body spread out on its shroud above the tomb. finally, the angels who are carrying the instruments of the Passion represent the Crucifixion. The figures in the central panel are noticably larger than those on the wings. The viewer thus feels closer to the central scene than to those on either side. Otherwise, however, the treatment of space is entirely traditional. On the left wing, for instance, the landscape behind the donor is quite shallow, and the figures are not shown one behind the other, but are ranged vertically and all depicted on the same scale. The gold background of all three panels is decorated with a motif of vine branches and grapes, symbols of Christ, the true vine.